In 2016, the Ancestral Women exhibit was showcased in Wausau at the Center for Visual Arts. 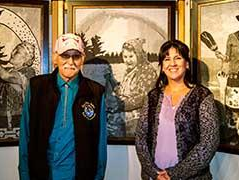 Vickie Ackley and her father, Fred Ackley, Jr., attended the opening of the exhibition, and viewed the weaving of Vickie’s Great-Grandmother Alice Ackley Randall. “After the exhibition, I started thinking about what my Great-Grandma had to go through and how she felt growing up. We take advantage of every day comforts, and she had to transition from her world. I wondered what it was like for her. She’s a little girl; her heart is happy and pure. She’s growing up in the old ways, the natural way of living. Everything is still natural,” Vickie remembered. Alice Ackley Randall was born near Lake Metonga in 1899. “She was raised in Crandon, which was just being established as a city. She had to be flexible, learning the old traditional ways but having to learn the colonization ways too. About the age of eight, the government was taking children and placing them in boarding schools. My grandma went to a boarding school to learn English. She only knew her language, and shared that she could still feel the sting on her face at that young age for talking in our language,” Vickie continued. “I jotted notes as I wondered what her thoughts were. She had to learn to go to school. She was growing up in our traditional ways, but was being forced to live another way. That’s what my grandmother had to endure. I wondered what her thoughts and feelings were. She married and moved to Antigo. When her husband was hurt on the farm, the Chief shared that there was a house available for her on the reservation. She lived the rest of her life on the reservation. An article I read said that she said she didn’t harbor any bitterness, and used her schooling to help our Tribe become established. She was the sister to our last Chief, Chief Willard Ackley, and they worked together for the benefit of our community. 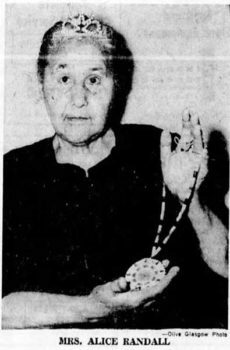 The Chief established a treaty for our reservation to be federally recognized, and because she had the education, she recorded everything. She was the Tribal Secretary for many years. The events were held in Milwaukee on November 9th and November 10th. The rehearsal was held at the Indian Community School on Friday, and the performance was held at the Milwaukee Public Museum on Saturday in conjunction with the “A Tribute to Survival” exhibition. Vickie hopes to participate in future presentations. To learn more about Ancestral Women project, visit the website. To learn more about the Tribute to Survival exhibition at the Milwaukee Public Museum, visit the website.